It doesn’t take a film scholar to know that sound is absolutely essential to an effective horror movie. An exceptional score can help something suspenseful ascend to something brilliant and bone-chilling, and even turn something as mundane as walking into a nail-biting piece of exposition. This year, sound has taken something of a front seat in horror: Writer-director-actor John Krasinski’s surprise hit A Quiet Place rode the absence of it to critical raves and box office gold. 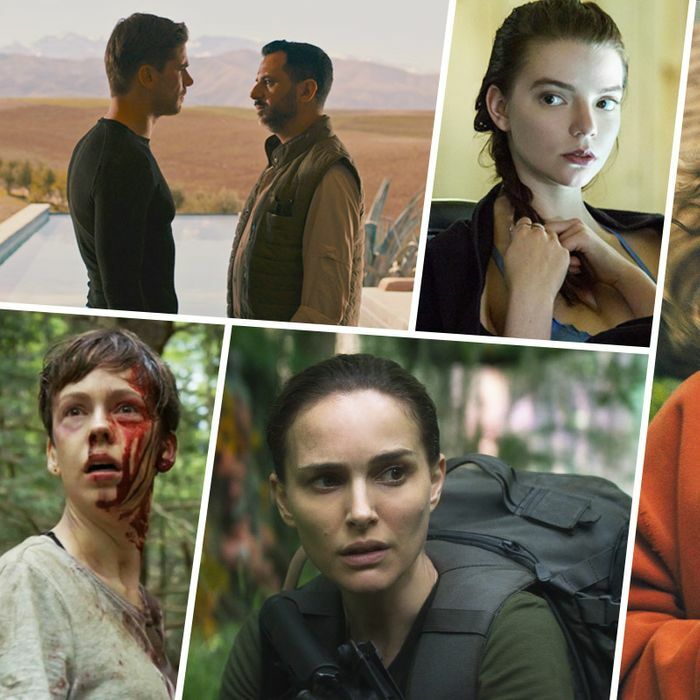 And along with jugular-piercing visuals, movies like Revenge, Annihilation, Hereditary, Thoroughbreds, and What Keeps You Alive have featured innovative, distinctly suspenseful film scores. Vulture spoke to the composers for all five of these films — the men and women behind this year’s most interesting and punishing scores — to break down how they designed sonic landscapes of anxiety. Read on to learn about the incredible versatility of the waterphone, how to make a heartbeat with the keys of a wind instrument, and which film score was designed as an arena for the actors to fight in. Colin Stetson’s score for Hereditary is ever-present, both literally and symbolically. For the two-hour movie, he provided about 90 minutes of music (Stetson calls it a “colossal score”), filled almost end-to-end with one of the most twisted vocal serenades imaginable — along with sounds suspiciously similar to that of a swarm of bats. Writer-director Ari Aster also wrote the script using Stetson’s non-film-related recordings as an inspiration, so his sound is baked into the soul of the story. Much like Hereditary itself, Stetson’s score covertly delivers one of the richest, most layered screen surprises of the year. Nothing is what it seems in Aster’s script, and its musical accompaniment is filled with hidden twists that the composer spoke to Vulture about. Do you have certain sound cues or tools you go to when creating a stressful scene? Or when you want people to empathize? What I tried to do with this was to imagine and amplify silence, and create a minimally directional and moving sound out of it. A lot of what ended up happening was me more or less trying to give shape, rhythm, structure, and dynamic to the minutia of moments imagined, and just that kind of palpable fear that you can have when you’re in a strange place and everything is quiet. But because you’re in the dark and your senses are heightened and searching for anything, making something out of that search was kind of what I was after. It felt like there was this continuous heartbeat sound that could have been there the entire time — but also maybe faded in and out? What was that? Those are all contact mics that I put on the keys of specific instruments. So all of the heartbeat-esque things or the very grating, metallic sort of crunching percussion that can happen throughout in tension-building areas, those are all percussive sounds that come from the saxophones and the clarinets. So yes, the heartbeats are all coming straight out of the horn, and they’re tied to the rhythms that the horns are playing in those particular scenes. In one of the first major incitement scenes, there’s a contrabass clarinet piece that’s entirely built around it. There were probably 12 mics alone in that one track. There’s a number of other things orchestrating around it, but the core being the solo live-rendered clarinet piece. I was consciously avoiding conventional tropes in the genre, using the ubiquitous strings and synths to create all of the creepy sounds. All of the stuff that people hear in the score and think are strings, the vast majority of all of that is actually clarinets and all high woodwinds. So, lots of things that may sound very synth-y and all of that dirty low-end, that’s all coming from low woodwinds, contrabass clarinet, and bass clarinet. There’s a whole host of different modes of processing that happened, and then a lot of real unconventional playing of individual instruments. I mean, I think if I was to do the math per sound, the majority would come from my voice, but you wouldn’t know it. I did everything on the score. I used a couple of violin patches that Sarah Neufeld had played, but those are not things that anyone would identify as being violin-esque. More to me they sound like — they sound almost identical, actually, to recordings of swarms of bats. So the stuff that sounds like swarms of bats is the violin, and the stuff that sounds like the violin is the clarinet, and the stuff that sounds like synth tends to be my voice. I’m playing with the idea of hiding in plain sight. The outcome of that long, close-knit collaboration is an audio and visual nightmare that’s divided into two worlds: Earth as we know it and the Shimmer, or what lies beyond a massive oil-slick-tinted dome containing a world of wondrous and terrifying mutations. Here’s what they had to say about making the sonic accompaniment to an alien-dance routine, and what instrument was the true MVP of Annihilation. So did you guys assemble a vision board filled with horrifying images on it and H.R. Giger drawings? Or do you work purely off the film? Ben: No. It’s the film. Literally the film is your guide — and Alex. Before we’d even read a script, before we’d even seen any pictures, we knew from talking to Alex that he had this concept musically, and in the film, of it moving from suburbia to psychedelia. So it’s moving from a recognizable human world, and at a certain point it’s going to be very, very Other. But you can’t introduce that otherness too early, because then you got nowhere to go. So then it’s creating a musical palette. We didn’t massively want to do an electronic score for Annihilation. We sort of held off. There’s no electronics in it until you get to the alien part. Geoff: It’s basically organic instruments that are altered, like what was happening in the Shimmer. How did the Shimmer affect the music? Ben: The Shimmer started having its own sort of thematic or musical elements. There’s this orchestral thing that we did right towards the end, which was a strange string pulse that gradually warped and went out of tune. That became one of the elements of the Shimmer sort of bearing down on people and starting to affect them. There was this instrument called the waterphone, which is acoustic, but it’s a bowed metal thing. That was always going to be our sound of the sort of beautiful aspect, the strange warped beauty of the Shimmer. Where you normally use a synth or strings early on in the film, all those slightly weird bits are all waterphone, and it was quite fun to do. Geoff: Yeah. It’s quite a psychedelic sound, and then we actually tried the idea of only using the waterphone on the whole film. That’s what we wanted to do. Just, how many sounds can we get out of it? Because it’s such a weird instrument. It does really low sounds and really screechy sounds, so you’re lucky in that sense. But we couldn’t get that far. What about the alien encounter? With something so pivotal, where it’s like the whole movie is coalescing and it’s going to shove us into the new world as we know it going forward — what emotions were you trying to surface in people? It’s harrowing to watch. Ben: It’s an absolute pile-on of loads of different emotions — this, like, sense of hypnotic beauty, even though it’s frightening. But it has to be said, there’s a lack of emotion in there, because the being isn’t responding emotionally at all. I think in that respect we were scoring the otherness of the situation, was the overriding thing. The alien isn’t necessarily overtly frightening. It’s not a baddie in the traditional sense. It doesn’t have any feelings. It’s literally just responding to her, and so we scored it as a psychedelic dance in a way. It was such a crucial thing and you don’t get the chance very often as composers to write a 15-minute piece with no dialogue, and we always expected at some point the whole thing would be cut. And it’s to everyone’s great credit that it wasn’t. Is there a certain kind of enjoyment that comes with knowing you’re going to be wringing anxiety out of people? It seems like a very fun challenge to do with music. Geoff: We both like making music that pushes buttons. To be given the chance to write something that is nontraditional — and then to give it a chance to be really nuts — that’s really going to be used by the director with the emotions. We’ve been very lucky. Erik Friedlander does not consider Thoroughbreds to be a horror film, which is funny, since the score he wrote for it is probably the single most compelling argument that it is one. The strings and percussion — frequently offbeat and sometimes atonal — feel threatening and uncomfortable. The film isn’t wall-to-wall music, but when his score is deployed, it feels like a persistent eye twitch, or a killer pursuing a nervous victim. Friedlander even manages to make the images of well-appointed teen girls walking through hallways feel like an edge-of-your-seat experience, and paired with the direction of Cory Finley, his music becomes a manifestation of the cacophonous anxiety rattling around inside the heads of the film’s odd-couple co-conspirators, Lily (Anya Taylor-Joy) and Amanda (Olivia Cooke). Friedlander talked to Vulture about what makes a great suspense score in his book. How would you assess the role of music in a suspense cinema? Do you consider it a foreground or a background element? It’s background, but it’s very aggressively background. I mean, I don’t know. Maybe it is foreground. This background element is there to provoke and scare you in suspense films. One of the most suspenseful films I know of is the first Alien. There’s hardly any music at all for long periods of time. It’s just quiet. There’s not a lot of music in [Thoroughbreds], but it’s featured in a way that they’re like these setpieces that come along infrequently, but they’re strong and they make an impact, and it’s kind of clever the way [Cory] used music in this film. You don’t need a lot of music and stabbings all the time. I think it’s gotten a little over the top. But, it’s part of the game with that kind of genre of film. Could you speak to some specific devices or tricks or sonic cues you like using when a scene calls for mounting tension or fear or anxiety? You can develop it in a scene, but you can also develop it over time through many scenes. I think a sustained note, a sustained violin, high-pitched sound — I’m always trying to find substitutions for some of that. I tend to go for creating sounds for each film using found-object-type things. I get a player in and I ask them to play the craziest sounds they make with their instrument and then I manipulate that, reversing it, compressing it, slicing them, slowing them down. They’re old tricks and everybody knows them, and I try to create new sounds that aren’t the hackneyed sounds you hear in an average horror-film trailer. But suspense and emotional tension can be gotten a lot of different ways, and I think it’s our job as composers to find something that’s a little less hackney, and a little more off the beaten trail. Did you have a favorite part of the score, something that was the most creatively satisfying or the most challenging? Yeah. I wrote a piece now called “Break Point” where the stepfather is playing a solo game of tennis with a machine that pitches balls to him, and he’s absolutely frustrated by the whole scene with his stepdaughter and her attitude and he’s missing balls and hitting them into the net and he just keeps whacking them, slapping them back. I wrote this really raw piece of music that captures the anger and intensity of this character, and I thought it was too raw, but everybody seemed to like it. I’m really proud of that track because it doesn’t sound like anything I’ve ever heard before. There are two featured leads in What Keeps You Alive, a cabin-in-the-woods revenge thriller about a pair of married women celebrating their wedding anniversary in the middle of nowhere. One of them is played by Brittany Allen, who’s also the film’s composer — which meant putting fresh eyes on a story she’d spent weeks living in from a single emotional perspective. “There were certain scenes where my connection to the material as the actor was really helpful,” says Allen of her third collaboration with writer and director (and her longtime boyfriend) Colin Minihan. “But there were certain scenes where I would have to kind of take a step back and go, ‘Oh, no. That’s not what the audience needs to feel at this moment.’ It’s about leading the audience to the fear.” The actress-composer spoke with Vulture about giving her scene partner, Hannah Emily Anderson, a “Terminator vibe,” and how to make an audience uncomfortable. So you starred in this film and composed the score, which is obviously atypical. How did you end up doing both jobs? I’d never scored anything before, but luckily at the time we were staying at my friend’s place, who has a beautiful piano. We chose two scenes that were pivotal in the film and we talked about the sounds we wanted to use and the influences that Colin had and what I wanted to bring to it. Then essentially he just said, “Okay, go. Give it a shot.” So I sat down at the piano, and right away it came pretty naturally. It was an exciting discovery for me, this whole process, but particularly at the beginning when I sat with this one very emotional scene at the end where [Allen’s character] Jules is faced with a decision. So I built the initial kind of melody and theme, and then I brought it into my computer to build some synths around to create the mood. And [Colin] never changed that piece. It stayed identical to that first night, and I think it was after that, we realized, okay, I can handle this. What kind of cues did you build to create that atmosphere of suspense or anxiety? I would layer the main piano melody line with another line that you could not necessarily hear, but that would pull the main melody down. If something was sounding too pretty I would do that, or always having like a dark rumble under things. You’re not necessarily picking out each individual sound, more about creating a feeling and distorting and masking any sort of beauty. How did you define the musical themes of your villain? Because they always have their own. I remember very clearly the morning that I woke up with the intention to score the moment in the film when you’re kind of really realizing who Jackie (Anderson) is. She’s getting ready and you are seeing her ritual and it’s very cool and calculated. I woke up super-early and I hardly had any lights on in the place, and there was a moment when I found this driving, repetitive, kind of slow — nothing is frantic about Jackie. She is very methodical. She’s not emotional, but there’s this foreboding, persistent, she-will-not-give-up vibe. As I’m talking to you right now I’m like pulsing my fists slightly to a little beat. That’s expressing it better than my words are able to right now. It was about creating this Terminator-type vibe without it being Terminator at all. I think this was a moment where bass really started to kick in and it was this unrelenting rhythm. Coralie talked about how important music was to her while putting the script together, so I wanted to talk to you about how you worked with her for this movie. Do you sort of decorate or set up your workspace to be reflective of certain things you want to be immersed in. Are there colors or objects, or are you really just using the movie as this singular point of reference? I get all the inspiration from the picture itself. And the only thing is that I live with the movie almost day and night when I’m working on it. As soon as I wake up I go straight to the studio and then the picture is there, and it’s literally there all day long. As long as I work, it’s there. So there’s always a picture running on the TV screen when I’m playing something. Always. I never hit the pause button on the remote, so whatever I play it’s linked to the picture I see so that I feel completely submerged in the picture. What does it mean for you to grab someone by the guts? Is that creating anxiety? Making people feel afraid, or making the music violent? It was something really related to the animal inside. Something very related to instinct, like when you are scared to death and you just want to survive. That kind of thing. I think the word “violence” was used a few times because she was really looking for something very pushy, very hard, very heavy in terms of violence. She really pushed me, I would say, beyond my own boundaries, because I think it’s the first time I composed music that’s strong and violent. So for you, is the music like character onscreen to you? Or is it more of a background component? In this movie, it was very special, because to me, it’s something very abstract and very symbolistic. The music for me it was more like a stage, you know? When you go to see a play, the stage is like an arena where all the fighters are gonna fight. So to me, the music was more this sort of an arena where it’s gonna happen, where the mythology can take place. In a way, the characters — except for Jen, of course, the heroine — don’t really matter. It’s all what’s happening there and how bad it got. The finale is so amazing in its execution. Was there something unique you applied to that particular scene? Because it’s such a culmination of everything we have been building toward. Coralie was with me when I scored it, and she was extremely helpful to always push me further. And she was always asking for more, and more violence, and more brightness, and more blood. That’s what she said about the shooting, that she was always asking, “More blood! More blood! More blood!” And she was exactly the same in the studio. Even when I thought it was too much, she was saying it wasn’t enough. Kind of like the same marathon that you see in the picture, that was a bit the vibe [laughs] in the studio. It was late at night and we were still pushing it further. So it was really quite intense, and also something very orgasmic in a way. Something really like, “Aaaaah!” Okay, so he can go even harder. It was very interesting.